From this release (2.0), WP MoneyClick will be released in the 2 editions: Standard and Professional. The standard edition contains all the needed tools to start monetizing your web site with a low-cost solution. Whenever you want you can upgrade to the professional version just paying the difference. Check out the compare page to see the differences between the standard and professional versions. 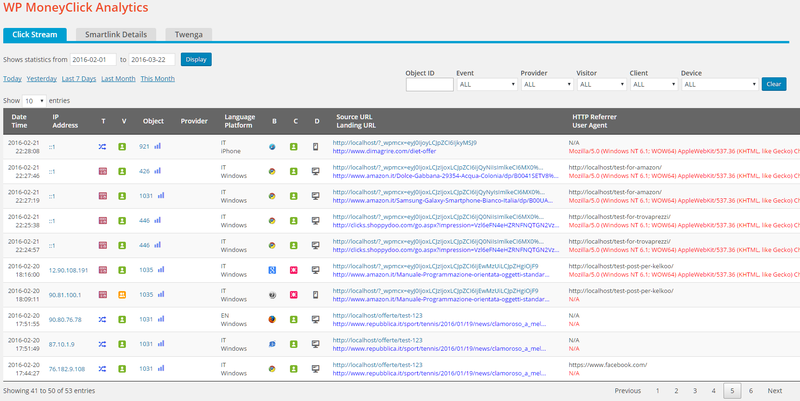 WP MoneyClick is able to track automatically each click to your contents and smartlinks. Statistics are updated in realtime in the Click Stream view. Apple iTunes provider is on board ! This is really a great news: we added Apple iTunes affiliation provider. 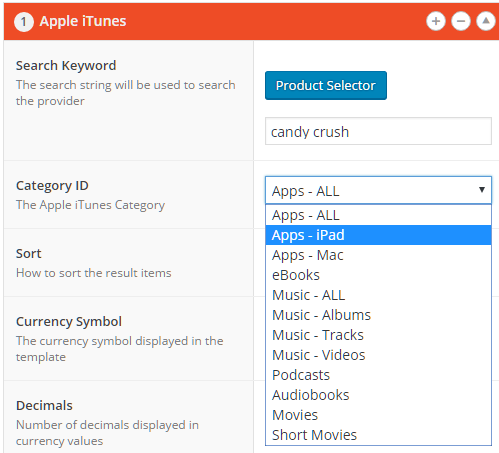 You can get commissions taking advantage from the huge Apple catalog: music (tracks & albums), books, movies and apps! Product page: this is the default. The affiliation cookie duration is 24 hrs. Add to cart page: this is a new option. The affiliation cookie duration is 30 days: multiply the possibilities to get commissions! 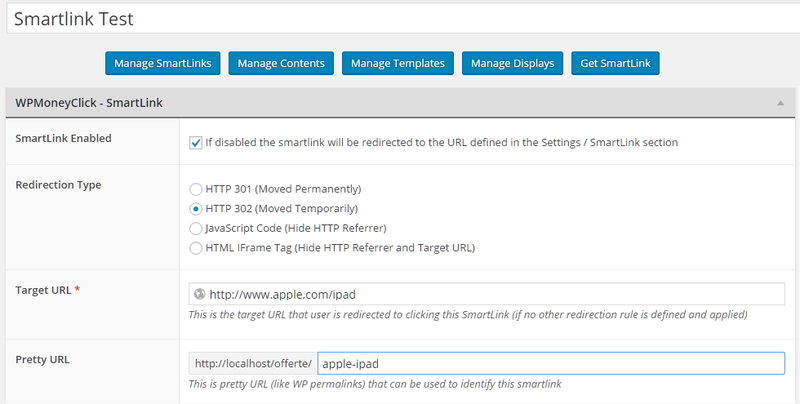 For each single smartlink, now is possible to define a kind of “permalink” that can be used as an alias for that smartlink. This is great both for SEO purposes as well as for readibility (for example when the smartlink is posted in a social network). 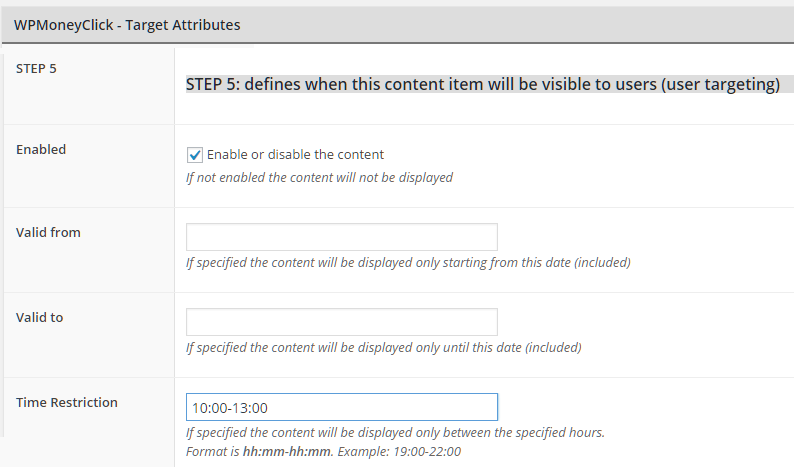 Defining a content is now possible to set a target restriction based on time hours. For example you may want that a particular offer is visible only between 10:00-13:00, while another one is visbile after 16:00, and so on. Now when using the shortcode [ wpmoneyclick ] it is possible to use an arbitrary list of data attributes (pair of name=”value”) that can then be used in the templates for custom renderings. All data attribute names must start with ‘data-‘. A new ‘note’ field is added to all MoneyClick entities: contents, smartlinks, templates, display and publishing groups/rules. This field is ignored by the system but can be very useful to take your notes associated with a particular context. 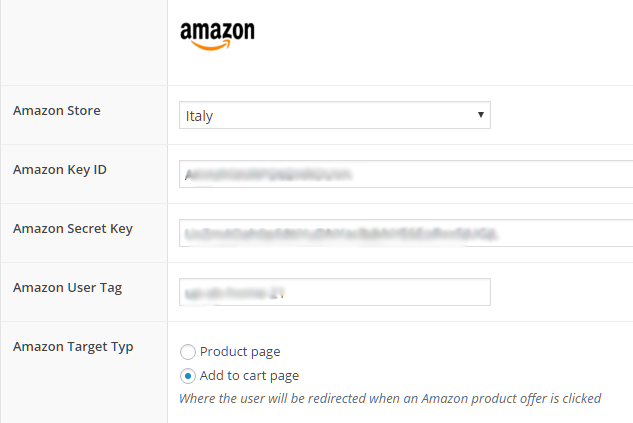 Product selector now shows product ID, useful for providers that allows per-ID search (like Amazon). New ready-to-use templates (100% responsive), optimized for Apple iTunes provider.